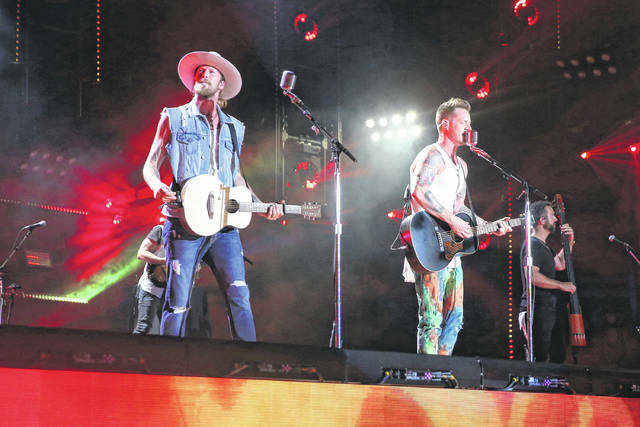 Brian Kelley, left, and Tyler Hubbard of Florida Georgia Line perform at the 2018 CMA Music Festival in Nashville, Tenn., on Sunday. Since blasting into the music scene in 2012 with “Cruise,” featuring Nelly, the duo of Tyler Hubbard and Brian Kelley is once again commanding the charts with Bebe Rexha on their co-written midtempo smash “Meant to Be.” The pop crossover hit is already three-times platinum and surpassed the number of weeks that “Cruise” spent on top the Billboard Hot Country chart. “Meant To Be” has been at the top for 28 weeks now, marking the longest time for a song by a woman to reign at No. 1, but it’s still behind the all-time country chart leader “Body Like a Backroad” by Sam Hunt at 34 weeks. They’ve collaborated with artists such as The Chainsmokers, Hailee Steinfeld and the Backstreet Boys and have teased new collaborations with Jason Derulo and Jason Aldean that will be on their upcoming fourth album, which doesn’t have an official release date yet. The pair has survived being initially painted as bro-country partiers following their first album, “Here’s to the Good Times.” Each successive album has allowed them to reshape their image as they write about their faith and their families. Both are married, and Hubbard is a new father to a baby girl. Their newest single, “Simple,” is yet another re-invention with a more stripped down, folk-rock sound. After being honored as trailblazers by Billboard magazine recently, Kelley said they’ve been successful by not following a traditional path in country music. Their collaborators and co-writers say that they are hard workers and committed to writing as often as possible. When not in Nashville, the duo has a Tree Vibez writing bus that will go out on the road with them, or with other artists, which gives them a place to write and cut demos just about anywhere. Each Friday their writers send them demos of songs, and they’ll respond back with comments and critiques.